President Barack Obama has broken hundreds of promises during his reign, but none have hit the American people quite as hard as the promise that "if you like your health plan you can keep it" under the health care law that unofficially bears his name. The resulting furor has forced his hand, and he has unilaterally decreed a change to the law which will "un-break" this particular promise -- until 2015. This is, to a limited degree, an increase in freedom and a rollback of the heavy hand of the State. When peace and freedom break out in any form, the astrological Pallas is involved. This case is not an exception. Transiting Sun conjunct Obamacare Pallas and Transiting Pallas quincunx Obamacare Sun: The Sun is (along with Mercury and the North Node) a primary activator for Pallas. These aspects bring peace (we recently explored this in the Syria war crisis) and freedom in the realm of political astrology. Transiting Mars semisquare Obamacare Mars: Mars on the Obamacare chart rules both the Sixth House (health, and the general citizenry) and the Eleventh (society and the public). The transiting Mars semisquare suggests an attack on the way Obamacare relates to both areas. Transiting Mars trine Obamacare North Node: This is ambiguous and intriguing, suggesting that the current change is somehow in line with the law's long-term destiny. Is this a hint at repeal? Transiting retrograde Jupiter square Obamacare Venus: Retrograde Jupiter in Cancer perhaps represents public sentiment against "forward" movement ("forward" does not always mean "good"). The square here against the Obamacare Venus suggests perhaps a temporary financial setback to the insurance companies that wrote the law in the first place. Transiting Mercury quincunx Obamacare Sun: News/communication (Mercury) that involves an uneasy adjustment (the quincunx) to the core of Obamacare (the Sun). 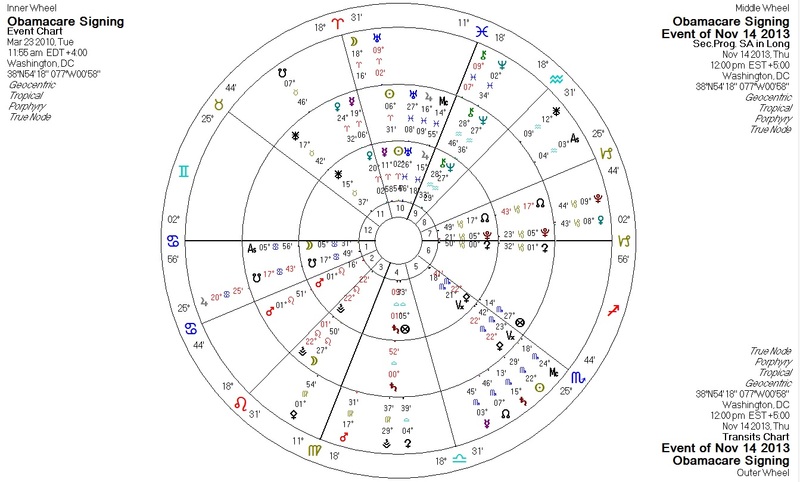 Progressed Moon opposite Obamacare Neptune: The Moon in the Obamacare chart rules the First House (essential being and action) and the Second House (resources/money) of the chart. This progression represents an aspect of the "falling apart" or "dissolving" of Obamacare since its official launch in recent weeks. This is good news... for the time being. Misguided economic policy is as deadly, or more so, than guns and bombs. For example: while the death toll from US-initiated wars in the past decade (probably in the low millions) is horrifying, the death toll from high grain prices due to ethanol subsidies was orders of magnitude higher. Obamacare remains a threat which will result in the loss of medical care, severe financial hardship, and/or death for large numbers of Americans if it is not repealed. Time will tell if the American people are smart enough to save themselves from this threat.